Our fashion industry clients join the delCane brand, created by passionate designers and fashion fans who are looking for a unique form in everything that surrounds them. DelCane is a top quality dog ​​and dog owner’s accessories – litter, lanyards, collars. The collection complements other accessories that allow you to create a unique interior and express your own style. All accessories under the delCane brand are designed and manufactured in the European Union, most of which are traditionally made by top-class craftsmen. Inspiration to create a collection of unique dog accessories has become a walk through the Milan Fashion Triangle, where the excellence of Prada’s designs mixes with exceptional aesthetics and gives it an unmistakable style. That’s where the delCane brand came into existence – a combination of functionality, style and trend. The philosophy of the brand is to create a harmonious space in the everyday life of the dog and its owner and to seek the perfect combination of fashion and design. The Italian origin of the delCane brand is a guarantee of excellent product quality and unique design. The delCane brand joins our prestigious fashion clients PRADA, Moreschi, Sartoria Rossi, Twin-Set and the Italian consortium Borgo Italia. 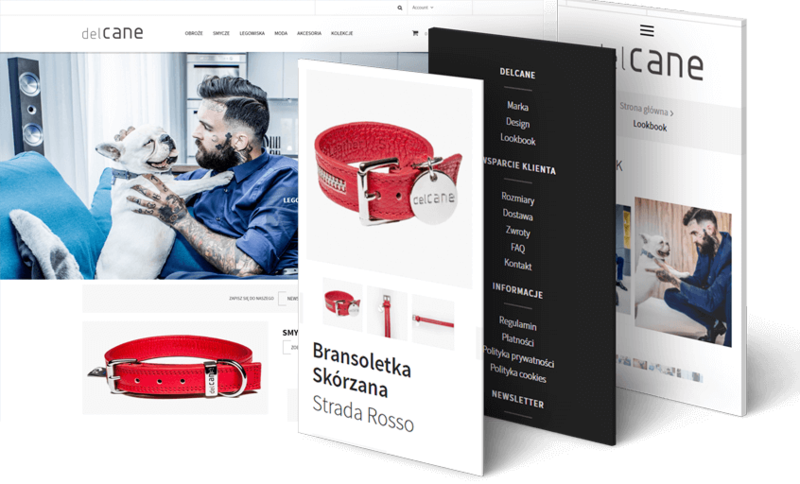 Sintra Consulting has done extensive work on web design and user experience, as well as extensive front-end and back-end Magento.